Salt the cucumber and leave it in a colander for half-an-hour and then drain well. Put it in a bowl with the garlic and the rest of the ingredients. Mix them all well with the help of a fork. 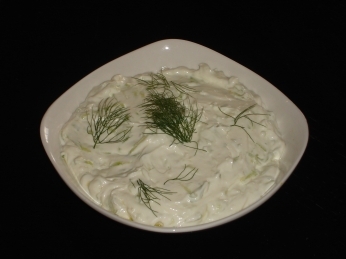 Put the dip in a bowl, add salt and decorate it with few dill leaves. I am so happy to have found this recipe, i have been craving this! Hi! Nice to meet you :D and nice to know about Greek recipes, hope you enjoy mine too! I tried to make this once by just adding cucumbers to yogurt with spices and it didn't work obviously. I have a question: How do you strain yogurt? You don't have to strain the yoghurt - it is sold as Greek strained yoghurt. I don't know where you live, but you should be able to buy it in good shops. If not, you can look at the Food Store on this blog and order it from there. Sorry, I forgot to mention, it's the Fage Total yoghurt on the first page of the Food Store - it doesn't say strained yoghurt, but it is. So glad to have found this site! Greek is my all-time favorite food to both eat & make! Authentic recipes are hard to find, though! I'm making this tomorrow and I bookmarked the wite so I can keep coming back. Wish these were in a cookbook or app so I could download them to my tablet. TOTALLY DELICIOUS. MY FIRST TIME MAKING TZATZIKI,I LIVE IN GREECE AND THIS RECIPE IS BETTER THAN ALL RESTAURANTS IVE HAD IT AT..I PUT LESS GARLIC THOUGH. DELICIOUS! Just to clarify, when you say "remove the skin from the cucumber and grate it", do you mean grate the skin (retaining the flesh to make Greek Salad, presumably), or grate the (peeled) cucumber? I ask only because I tried the former and it's good (though kinda tricky) but the latter would, I imagine, yield rather a wet mess, even after salting. I also left out the olive oil (I'll drizzle some over when I serve it) and vinegar (natural yoghourt is quite acid already) and will use far less garlic next time, but it tastes great for a first attempt with a new recipe I've not tried before. Hi Ceri! I'm glad you're happy with your result. You throw away the skin of the cucumber and grate the cucumber itself (but not too finely, as we mention). I have been making Tztziki for years now and think this is a good one. I noted something though, 100ml of olive oil is a bit to much, must have meant 10ml. I also skipped the dill. If you don't have Fage or other Greek yoghourt, put plain yoghourt in cheesecloth and strainer, tie it, put a small plate on top and let it sit in the fridge overnight. i agree.. 100 ml olive oil is WAY too much. I just returned from a trip to Florida and ate at my favorite Greek restaurant in Tarpon Springs. They told me that their secret to creamier Tzatiki is that they add some sour cream to thin it out and it was awesome! I can't wait to make it this week.